“TEKKEN REVOLUTION™” and Tokyo Otaku Mode™ Collaboration Brings Special Featured Frames to Otaku Camera! TOKYO – Tokyo Otaku Mode Inc. (TOM) is featuring frames of the PlayStation®Network game “TEKKEN REVOLUTION™,” the latest release in the fighting game series “TEKKEN®,” on its smartphone app Otaku Camera beginning on June 12, 2013. The feature is available worldwide on the Otaku Camera app via iTunes Store® and Google Play™ free of charge for a limited time until Sept 11, 2013. This collaboration is to celebrate the worldwide release of the PlayStation®Network game “TEKKEN REVOLUTION™” produced and published by NAMCO BANDAI Games Inc. “TEKKEN REVOLUTION™” is a part of the popular fighting game series “TEKKEN®,” which has sold a total of 45 million copies around the world. With this collaboration, Otaku Camera users can take pictures with characters or in scenes from “TEKKEN REVOLUTION™” using 18 full-color frames. This is the first Otaku Camera collaboration to feature video game characters. The app offers many special frames that feature characters from anime, manga, and other famous works, including, “Hello Kitty World,” “Tiger & Bunny,” and “AMUROCH☆USAVICH.” With many more Otaku Camera collaborations featuring anime, manga, and popular characters expected in the future, TOM will continue to create new ways for the world to enjoy Japan’s otaku content. 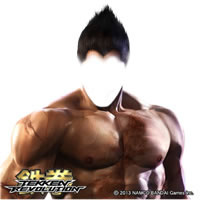 “TEKKEN REVOLUTION™” is an online-only title on the PlayStation®Network that can be played free of charge. For the first time in the “TEKKEN” series, this game features character growth and training components. Due to a new system not seen in fighting games thus far, this newest installment in the series is a genuine fighting game that even players who are new to the series can enjoy. NAMCO BANDAI Games Inc., a part of NAMCO BANDAI Holdings Inc., is a leading global publisher and developer of interactive contents – including all major video game consoles, amusement machines (arcade products) and network platforms such as mobile and online. The company is known for creating and publishing many of the industry’s top video game franchises, including PAC-MAN®, Tekken®, SOULCALIBUR®, NARUTO™, NARUTO SHIPPUDEN™, Dragon Ball®, GALAGA®, RIDGE RACER® and ACE COMBAT®. More information about the company and its products can be found at http://www.bandainamcogames.co.jp/english/. Otaku Camera is an iOS and Android app that allows users to mangatize any pictures from their mobile devices. With over 100* different frames to choose from, users are able to create one of a kind, manga-style works of art from a wide range of photographic subjects including people, objects, and scenery. The interface also allows users to effortlessly shoot and create manga-style pictures using either the front or back camera on their mobile devices. Additionally, users can also mangatize any pictures already stored in their mobile devices. Users can easily enjoy photos created using Otaku Camera with friends and family by instantly sharing them on social sites such as Facebook and Twitter, or by saving them to their device. Tokyo Otaku Mode™ (TOM) is a worldwide distributor of otaku content, including anime, manga, cosplay, and otaku entertainment news. Owned and managed by Tokyo Otaku Mode Inc., which was incorporated in Delaware, US in April 2012 by President and CEO Tomo Kamei, TOM has operated its Facebook page (https://www.facebook.com/tokyootakumode) since March 2011. In just two years since its launch, TOM has accumulated over 12 million* likes on Facebook, becoming the largest Facebook page operated by a Japanese company. Currently, 99% of its fanbase reside outside of Japan, with fans particularly increasing in Asia. TOM also launched its own website, Tokyo Otaku Mode (http://otakumode.com), in 2012. The website offers otaku entertainment news articles in English and a user-generated content (UGC) platform on which TOM subscribers can upload their own self-created otaku artwork, cosplay photos, and more.